Still not many things flowering here in Minnesota. We had more snowfall only days ago and unseasonably cool temperatures. 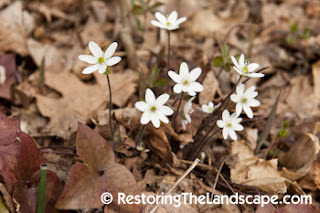 The Bloodroot and Hepatica are flowering although in our yard, a nice cheery sign of spring after this long winter. 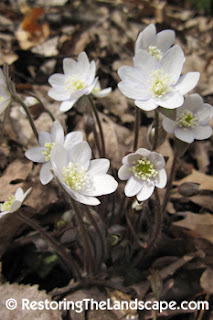 Hepatica are a woodland spring ephemeral native, both the Sharp Lobed (see the pointed leaves in the second photo), and the Round Lobed (Hepatica americana) are native to the upper Midwest. The flower (sepals) can range from pure white in color to medium pink to a dark purple. The hairy stemmed flowers emerge in a cluster from the woodland leaf litter in mid to late April and like many other spring ephemerals, the flowers open up in the warm sunny spring days. The mottled liver-like leaves from the previous year remain and new ones emerge when flowering has finished. 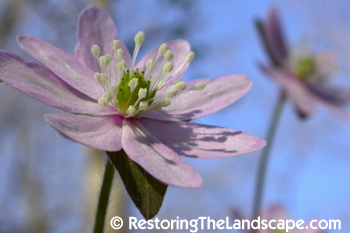 There has been a significant decline in Hepatica populations. One study conducted at the University of Minnesota tried to determine if non-native earthworms played a role in plant diversity due to the reduction of the quantity of leaf litter. Read the study here. Sharp Lobed Hepatica is native from Ontario south to Arkansas and eastwards.